Astronauts Greg Chamitoff and Mike Fincke work on the exterior of the International Space Station during the fourth spacewalk of the STS-134 mission, May 27, 2011 (Flight Day 11). This story was updated at 10:05 a.m. ET. HOUSTON – Two Endeavour astronauts completed the final spacewalk of their mission, in what was also the last ever spacewalk conducted by shuttle astronauts, as NASA brings its storied shuttle program to a close later this year. Mission specialists Mike Fincke and Greg Chamitoff spent a total of 7 hours and 24 minutes on Friday (May 27), working outside the International Space Station, in a spacewalk that not only completed assembly of the orbiting outpost, but also surpassed several important milestones. 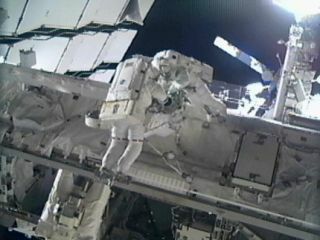 The official end time of today's spacewalk was 7:39 a.m. EDT (1139 GMT). "This is the last flight of space shuttle Endeavour, but it is also the last spacewalk by shuttle crew members for station assembly," Chamitoff said near the end of today's outing. "It is kind of fitting that Endeavour is here, because Endeavour was the first shuttle to begin construction for station and so it is fitting that she's here for the last mission to finish assembly." Astronauts Mike Fincke and Greg Chamitoff make the final spacewalk of shuttle Endeavour's STS-134 mission. The first spacewalk conducted by shuttle crewmembers was performed in April 1983 by astronauts Don Peterson and Story Musgrave. Since then space shuttle crewmembers have performed 164 spacewalks, including the four that were performed during Endeavour's STS-134 mission. "This was the last planned spacewalk for the docked mission, and also the last spacewalk conducted by space shuttle crew on the station," lead space station flight director Derek Hassmann said in a news briefing today (May 27). "Again, a very successful [spacewalk] – it's a tribute to all the work and preparation that goes into these spacewalks, both by team on the ground and the crew on orbit." During today's outing, the number of hours spent on spacewalks to build the space station also surpassed 1,000. The milestone was achieved at 5:02 a.m. EDT (0902 GMT). "During this EVA, we tallied altogether collectively over a thousand hours of spacewalks as part of station assembly," Chamitoff said. "Mike and I have the honor here to share this last spacewalk and of course, with all the folks working on the ground, thousands of people who helped build this, working in the shuttle and station programs. We're floating here on the shoulders of giants." Hassmann also recognized the hard work, not only by the spacewalkers themselves, but also those who choreograph, train and oversee the spacewalks here on the ground. "It's a bit of a bittersweet moment for the team who pours their lives and focus over a number of years into these [spacewalks]," he said. "We've got a lot of work ahead of us, but in terms of this mission, that's what I'll look back on the most, the great people I work with and the wonderful crew we had to go execute it." For the flight controllers here in Mission Control, even though there are still plenty of tasks ahead, they can breathe a sigh of relief after the completion of four lengthy and successful spacewalks. "I couldn't be more proud of how this mission has run its course over these four [spacewalks]," lead spacewalk officer Allison Bolinger told reporters today. "Everything went so well." The main objective for today's spacewalk was to move Endeavour's 50-foot (15-meter) long inspection pole, called an Orbiter Boom Sensor System (OBSS), to its new position on the exterior of the space station. On shuttle missions, the OBSS is attached to the end of the orbiter's robotic arm to perform detailed inspections of the vehicle's heat shield. Astronauts assess the heat shield tiles several times during missions to look for any damage from launch and the time spent in orbit. The boom usually returns to Earth onboard the shuttle, but since this is Endeavour's final flight, the OBSS was permanently installed at the station for future use as an extension of the station's own robotic arm. "On behalf of the STS-134 crew and Expedition 27 crew, space station assembly is complete," shuttle commander Mark Kelly radioed to Mission Control in Houston after the inspection pole was attached to its new home. The spacewalkers then switched out a shuttle-specific hardware fixture on the OBSS, replacing it instead with a power and data grapple fixture that will enable its use by astronauts using the space station's robotic arm. The former inspection pole can be attached to the end of the station's robotic arm to effectively double its reach. As part of the space station, the boom is now officially known as the Enhanced International Space Station Boom Assembly. Flight controllers at NASA's Johnson Space Center in Houston made the decision early to extend the planned 6 1/2-hour spacewalk to give the astronauts enough time to finish all the scheduled tasks. Fincke battled some stubborn bolts to release fasteners on a spare arm for the station's Dextre maintenance robot, and Chamitoff was able to complete some other tasks, which included tightening one of Dextre's tethers and photographing an experiment located on a stowage platform brought up by Endeavour. Chamitoff, who was conducting the second spacewalk of his career, also took some time to photograph the space station in its now-completed state. Later tonight, at around 9 p.m. EDT (0100 GMT), Fincke will also become the new record-holder for the number of days an American astronaut has spent in space, surpassing Peggy Whitson's total of 377 days. On his second spacewalk, Chamitoff has now accumulated a total of 13 hours and 43 minutes spent outside the space station. Fincke, who has now completed his ninth career spacewalk, brought his total up to 48 hours and 37 minutes. This moves him into the number six spot on the all-time list of spacewalkers. Today's outing was the 248th spacewalk performed by U.S. astronauts, and the 159th in support of space station assembly and maintenance, bringing that new total to 1,002 hours and 37 minutes of spacewalking time. "I wanted to say congratulations to the shuttle program after the many successes we've had over 30 years," Fincke said as the spacewalk wound down. "Congratulations to the [spacewalk] development team, we've come a long way. From me and Greg and the rest of the crew, congratulations."